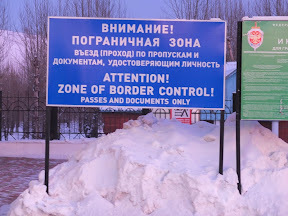 I am currently sat at the Russian border waiting for my passport to be returned before we trundle over into Mongolia. A visa point in passing – Russian immigration don’t seem at all fussed about deregistering our visas. After going to the trouble of registering it in Moscow in the first place, I’m disappointed they don’t seemingly want (or need) to deregister it. Perhaps the exit procedure does this automatically in the system these days? It’s too complicated a question to try and ask, so I’m just going to not worry about this. There is absolutely nothing to see or do here – except take a shower in a single spotless and well heated bathroom on the platform. The only snag is they just have one shower, and Stephan has called “shotgun”. As I’m panicky about being left behind at the best of times, I’m not going to risk it. The thought of running naked down the platform after the train in the snow isn’t a good one. There are a whole load of officials here on the train now – Police, Army, Russian sniffer dogs, Mongolian sniffer dogs, immigration, and plain clothes people with torches – its a busy place. The Mongolian customs officer (but still in Russia?) asked me if I had anything to declare. I showed her my vodka & wine stash and she looked at me as if to say that I might not actually have enough booze, before wishing me a “Happy New Year”! I thought it was all over when an immigration lady returned my stamped passport a few minutes ago, but there is now another Russian woman searching my compartment (which I had to leave) and I can see that she takes pride in being thorough. I put up my Christmas decorations today, and they seem to be a bit of an icebreaker – even some of the severest looking security people allow themselves a smile when they see my mini Christmas tree flashing away! We seem to be without a restaurant carriage tonight, so I’m going to use some of my emergency rations – possibly the Russian equivalent of the Pot Noodle, the “Pot Potato”.. I feel a movie coming on, assuming they let me into Mongolia. 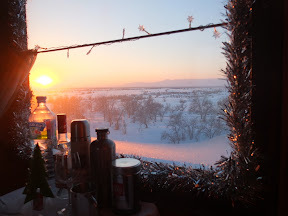 I’m thinking of watching “Spies Like Us”..
Update – I’m finally “in” after repeating the same process at Dozorne, on the Mongolian side of the frontier. My compartment has now been searched twice and seen three different sniffer dogs so far. The last official who visited me was so friendly that I mistook him for a black market currency trader at first, but I saw he was wearing a police or customs badge under his parka. He shook me by the hand (twice) and wished me a nice trip to Mongolia. It’s a pity that you don’t see that at Heathrow T3..! Another update – this man must have been playing “good cop – bad cop” with his colleague, who has just returned my passport. He spent an unnatural amount of time comparing me to my photograph and he clearly prides himself in looking very severe in his leather great coat and official briefcase. He didn’t even smile at my Christmas decorations. Bar humbug!